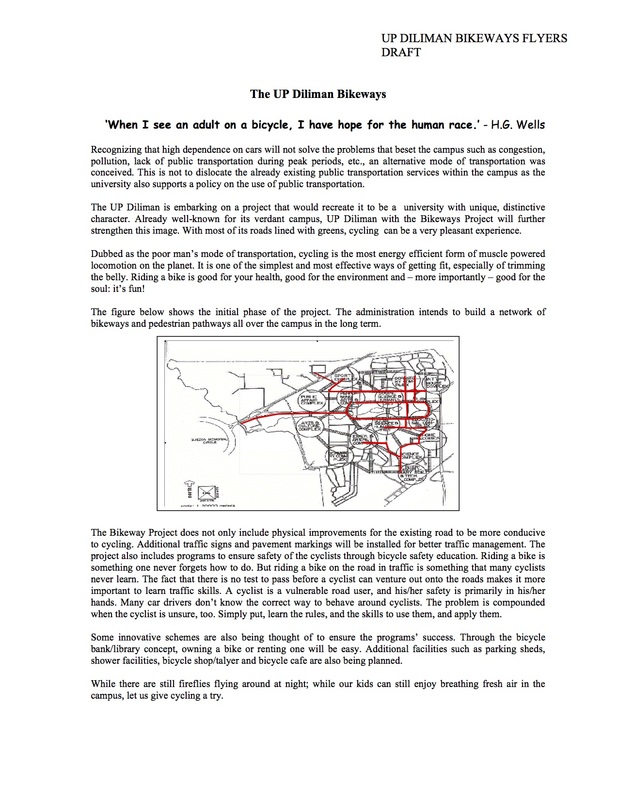 Searching for material on the proposed bikeways network at the University of the Philippines Diliman campus, I came across a draft of a flyer. The flyer was intended for use in consultations with stakeholders including members of the UP Diliman community (e.g., staff, students, faculty and residents). I recall that there was also a committee established for the purpose of planning and implementing the UP Diliman Bikeways. Unfortunately, the network was not fully realised and took a few years before a major component was implemented but under a different project – the UP Diliman Model Traffic Safety Zone project. At present, UP Diliman is again considering the bikeways network proposal and has initiated some studies towards determining its feasibility including what routes would be most viable. Incidentally, our students in one of the engineering elective courses offered by the Institute of Civil Engineering is currently surveying candidate routes and they should be finished with this task by middle of March. It would be interesting to see which “corridors” can be proposed as the next components of the network to be realised. By d0ctrine in Cycling, EST on February 20, 2015 . I stumbled upon your blog looking for information on the old bikeways plan for UP Diliman. I currently work with UP Bike Share and we are collecting data that would be helpful in proposing a more concrete plan for bicycle infrastructure, particularly bike sheds, bike racks and improved bikeways. May I ask if you have more information on the bikeways flyer? Would you also happen to have contact information on the student surveying candidate routes for the campus? You can email me through kmayuga3@gmail.com. This is an article written more than 2 years ago and that flyer is perhaps the only remaining material we have from the time UP Diliman considered a network of bikeways for the campus. Since then, UP Diliman through the Office of the Vice Chancellor for Community Affairs (OVCCA) reconstituted the UP Diliman Bikeways Committee. Since there seems to be no developments on this since 2015, its safe to assume that the committee is basically dormant. Meanwhile, the students were supervised by Dr Ricardo Sigua but since the work was for a course handled 2 years ago, I’m not certain he would still have their reports with him. Dr Sigua is currently the Director of the Institute of Civil Engineering and was previously involved in bikeways planning for the campus. You can contact him via rdgsigua@yahoo.com.